Pass & Seymour Straight blade single receptacle in light almond color, has a unique design with impact-resistant nylon face and PVC back body construction for long-life durability. This 2-Pole, 3-Wire receptacle features 0.042-Inch corrosion-resistant, zinc plated and tabbed steel strap and triple-wipe brass contacts for lasting retention. It operates at a voltage rating of 125-Volts AC, current rating of 20-Amps and dielectric strength of 2000-Volts. It also features dual mechanical shutter system to help prevent insertions of foreign objects. It is suitable for residential, hospitality/lodging, retail, multiple dwelling, office and education applications. 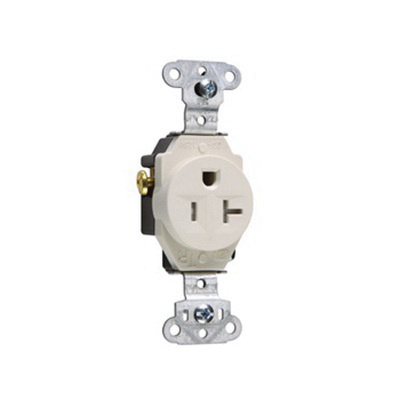 The tamper-resistant single receptacle meets UL, File Number E140596, Standard UL498, Federal Specification WC596, CSA and CSA C22.2 No. 42 standards.